June is not going to be dull…! For me personally, this is a big week – I am looking forward to speaking at the NHS Confederation Annual Conference on Wednesday. The session I am involved in, chaired by Dr. Mark Newbold, is about urgent care of older people. The emphasis of my contribution is around prevention, holistic approaches and joined-up systems, ensuring that life is not over-medicalised – the simple things that make life worth living. @WhoseShoes Not a fan of capitals usually as you know but forgot v imp message DO SOMETHING ABOUT (scandal of) NHS CONTINUING HEALTH CARE. Preparing my presentation brings home yet again the parallels and key themes across all areas of my work. Hardly surprisingly really as we are all people; aspirations, hopes and fears and the desire to have control over our own lives do not suddenly change just because we get older. Today starts the month with a bang. 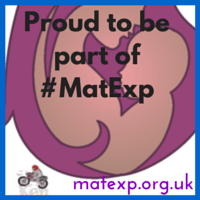 Our #MatExp campaign, to improve the maternity experience of women everywhere, goes up a gear. For anyone who has been twiddling their thumbs and wondering what to do with themselves since the end of the #MatExp alphabet (yes, we know who you are! ), you will be delighted to know that June is a month of action! 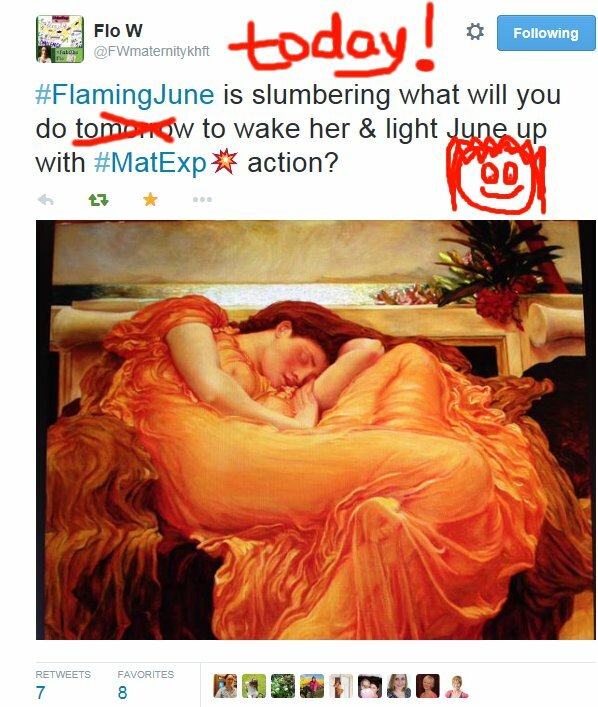 #MatExp #FlamingJune – we are just waiting for the weather to catch up … although perhaps it is just as well it is a bit cool outside or the energy burning in this remarkable grassroots campaign might just start some forest fires! Sheena Byrom is an extraordinary woman. As her action for June, she is posting blogs from individuals who have information to offer to the new team set up to conduct a national review of maternity services in England, led by Baroness Julia Cumberlege. We all feel passionately that this new review team needs to engage with the action-focused, inclusive work of what has now become an unstoppable social movement for positive change. And so it is a huge honour that Sheena invited Florence Wilcock and me, as the initiators of the #MatExp campaign, to write the opening blog and tell everyone what has been happening and why is it so important for these links to be made. Sheena is publishing our blog today on her site. But for ease you can also read it below. We are all working together in a very strong collaboration and taking the view that the more different channels we can use to spread the word and involve more and more people, the better! We would like to kick off Sheena’s June blogging series with a strong call for the Maternity Review Team to engage with our fabulous #MatExp grassroots community. We need to build on all the amazing work that has been happening over recent months through this passionate, inclusive group. 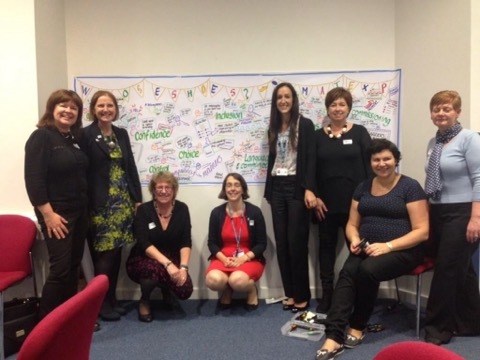 So what is #MatExp and how did it come about? A lot has been written about this already – for example, Florence’s ‘in my shoes blog’. Florence and Gill made this short video when, due to the phenomenal grassroots energy it had inspired, #MatExp was included as a major campaign in NHS Change Day, 2015. Users came forward not only to join the various actions but to initiate and lead them themselves. You can check out the actions here but they cover everything from appropriate language, postnatal support, best practice and experiential learning – including many male obstetricians spending time in the lithotomy position! Florence is a passionate obstetrician and clinical leader, who was asked by the London Strategic Clinical Network to find ways to improve maternity experience in response to a poor CQC report identifying that six of the seven worst trusts in the country for maternity experience were in London. Florence approached Gill, the creator of Whose Shoes?, to co-produce some challenging Whose Shoes? maternity scenarios and run a series of workshops, getting users and professionals and all other interested parties – NCT, MSLCs, everyone! – to work together as equals and come up with imaginative solutions. 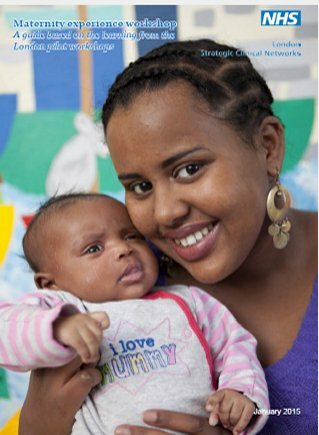 With support from NHS England, five very successful and fully subscribed workshops were held across London. The combination of the face-to-face workshops and the social media network have been extraordinary, with lots of overlaps. For example Helen Calvert and Leigh Kendall, two of the mums now helping lead the campaign, came down to London to join the workshops and they also contributed to the #MatExp NHS 6Cs webinar. The Whose Shoes? workshops, supported by a full leadership and facilitation toolkit kit developed in partnership with the London SCN and NHS, are now planned at other London hospitals and spreading to other parts of the UK, including a session in Guernsey at the end of June. There is a lot of cross-fertilisation of ideas between localities and between hospitals, with a strong emphasis on building relationships and collaborations. Each workshop culminates in pledges and a local action plan, formulated by the people at the workshop and encapsulated in a powerful graphic record. Graphic record from our #MatExp Whose Shoes? workshop, held at Kingston Hospital. New Possibilities are the graphic artists. Inevitably the themes are similar between the different sessions but with a strong local emphasis and most importantly local ownership, energy and leadership. It would be easy for the NHS Change Day campaigns to lose momentum after the big day itself, (11 March). #MatExp has done the opposite, continuing to build and bring in new people and actions. #MatExp #now has 110 million Twitter impressions. We have just finished the ‘#MatExp daily alphabet’, a brilliantly simple idea to get people posting each day key issues related to the relevant letter of the alphabet. This has directly led into the month of action starting today, 1 June! Helen Calvert set up and ran a survey of health care professionals. She had 150 responses within about 10 days and analysed and reported the results – an extraordinary contribution. We have a vibrant Facebook group (please apply to join – initiated by fab Helen Calvert @heartmummy) and the brand new website (LAUNCHED TODAY! – huge thanks in particular to Leigh Kendall @leighakendall) set up by the #MatExp team of mums who are incredibly focused, working long hours – all as volunteers. We are all absolutely determined to keep working together to improve maternity experience for women everywhere. This entry was posted in community engagement, compassion, dementia, Gill's Mum, health, in my shoes, personalisation, social care, well-being and tagged #MatExp, choice, choice and control, dementiachallengers, maternity, maternity review, NHS Confederation, older people, Quality of life, relationships. Bookmark the permalink. 1 Response to The #MatExp month of ACTION begins today. Why women everywhere need the Maternity Review Team to engage!